The origin of vaccinia virus is unknown. Controversal question, is Vaccinia Virus a form of smallpox virus? NOTE: Should smallpox virus be destroyed? IOM: Selected quotes from Long article re Should smallpox virus be destroyed? Rosenthal SR, Merchlinsky M, Kleppinger C, Goldenthal KL. New stockpiles of smallpox vaccine are required as a contingency for protecting civilian and military personnel against deliberate dissemination of smallpox virus by terrorists or unfriendly governments. The smallpox vaccine in the current stockpile consists of a live animal poxvirus (Vaccinia virus [VACV]) that was grown on the skin of calves. Because of potential issues with controlling this earlier manufacturing process, which included scraping VACV lesions from calfskin, new vaccines are being developed and manufactured by using viral propagation on well-characterized cell substrates. We describe, from a regulatory perspective, the various strains of VACV, the adverse events associated with calf lymph-propagated smallpox vaccine, the issues regarding selection and use of cell substrates for vaccine production, and the issues involved in demonstrating evidence of safety and efficacy. RE: the Controversal question, is Vaccinia Virus a form of smallpox virus? Note an article by the IOM that addressed the question, 'Should Smallpox stocks be distroyed? ', has some good material to help one understand this question. Summary: To put it in a nut shell. The answer to the question above depends not only on science, but as usual in the vaccination arena, it also depends upon political and finanacial pressures, plus the all important perceptions and beliefs about the value of vaccines, the germ theory of disease, and the germ theory of disease severity. It is not DNA that answers the question, "Is Vaccina Virus a form of Smallpox Virus", but rather clinical experience which must anwer the question. The genomes of both variola and vaccinia have been sequenced and are 95 percent identical . Smallpox was eradicated before the development of many modern techniques of microbiology. In 1999, only 2 strains of variola major, and only 1 strain of variola minor had been DNA sequenced. There are no known natural hosts of vaccinia virus, and its origin is obscure. Given the above limited information, the question of whether vaccinia is smallpox must be answered from its "EFFECTS" (clinical experience) an area hightly fraught with belief systems. http://www.bt.cdc.gov/Agent/Smallpox/SmallpoxImages.asp Graphic clinical images of smallpox. 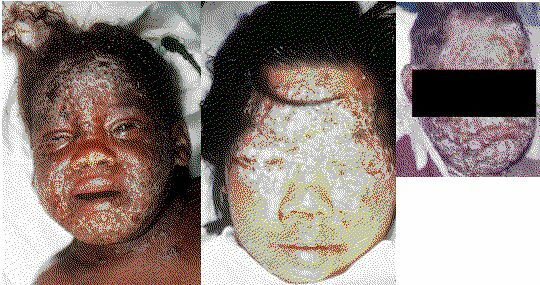 http://www.bt.cdc.gov/Agent/Smallpox/VaccineImages.asp, Graphic clinical images of smallpox. Composite of two .JPG photos -reduced size- from CDC site for SmallpoxImages.asp - for full size on CDC site, click here. Graphic clinical images of reactions to smallpox vaccinations. For full size on CDC site, Click here. Does the upper composite photo show a different disease than the the lower composite photo? Should smallpox virus be destroyed? The relevance of the origins of vaccinia virus. Department of Medical Microbiology, University of Liverpool. The fate of surviving stocks of smallpox virus is still uncertain, and it is important that arguments in favour of retention or destruction should present balanced evidence. This article balances the view, probably incorrect and possibly alarmist presented earlier in this Journal by Peter Razzell, that vaccinia and cowpox viruses were derived from smallpox virus. The generally accepted alternative view that all three viruses are independent species and that smallpox virus could not emerge through simple mutation of the other two is presented, together with appropriate literature citations. A quote from the IOM article, "...responses to orthopoxvirus infections in humans comes from studies of human subjects in immune-deficient states who are subsequently vaccinated with vaccinia virus. In children with immunological defects in cell-mediated immunity, vaccinia virus replicates without restriction, resulting in a continually progressive primary lesion, persistent viremia, and widespread secondary viral infection of many organs." The genes involved in DNA replication, gene expression, and assembly of new virions are located mainly in the center of the DNA genome. Studies from many laboratories with different strains of poxviruses have shown that the genes involved in virus-host interactions are located near the ends [7,8]. It is there that most of the differences among the genomes of the poxviruses are found--in those regions determining the interactions with the immune system of the host. Investigations of these interactions are likely to provide fundamental insights into human biology and the functioning of the human immune system. Studies of other viruses provide extensive support for this belief . One notable example is the wholly unexpected finding that proteins within the endoplasmic reticulum can be targeted for destruction and transported into the cytoplasm by virus-encoded gene products . Smallpox was eradicated before the development of many modern techniques of microbiology. As these tools emerged, they were generally applied to studies of pathogens posing current health threats. Partly as a result of the successful eradication of smallpox, therefore, modern analytical techniques have not been applied to enhance understanding of the pathogenesis of variola virus in the human host. Vaccinia Virus. Vaccinia virus has been propagated by humans for use as a smallpox vaccine for the past 200 years. There are no known natural hosts of vaccinia virus, and its origin is obscure. All present strains of vaccinia virus are genetically related, although they exhibit different biological properties in the laboratory. Most strains have a wide host range in experimental animals, and all exhibit rapid growth on the chorioallantoic membrane cultures. Since the early 1980s, strains of vaccinia have been engineered to express genetic information for other viral and bacterial antigens or immunomodulatory proteins. Vaccination against smallpox is most effective by infection of the skin with vaccinia virus, followed by extension of replication to the lymph nodes and spleen, which elicits cell-mediated and humoral immune responses that provide protection against infection with variola virus. The human immune response to viruses is a complicated process about which much has yet to be discovered. Furthermore, knowledge of interactions between the immune system and variola virus is limited because modern techniques for the study of immune responses were developed after smallpox was eradicated. The best information on the relative importance of cell-mediated and humoral immune responses to orthopoxvirus infections in humans comes from studies of human subjects in immune-deficient states who are subsequently vaccinated with vaccinia virus. In children with immunological defects in cell-mediated immunity, vaccinia virus replicates without restriction, resulting in a continually progressive primary lesion, persistent viremia, and widespread secondary viral infection of many organs. In patients with thymic dysplasia and partially or completely intact immunoglobulin-synthesizing capacity (Nezelof's syndrome), the progression is slower and less persistent, but usually results in death. Delayed-type hypersensitivity reactions are not evoked in patients with progressive vaccinia, nor can their peripheral blood lymphocytes be stimulated to undergo mitosis by exposure to inactivated vaccinia virus. Although neutralizing antibody is sometimes present in the serum, its presence does not prevent the development of progressive vaccinia if cell-mediated immunity is defective. The process of inoculating smallpox material is called variolation to distinguish it from vaccination, which uses cowpox or vaccinia virus. After variolation of the skin, a primary lesion develops at the inoculation site on about the third day, and satellite pustules are common. But the rash is usually much less severe than with naturally occurring smallpox. Historically, case-fatality rates were between 0.5 and 2 percent after variolation, compared with 20 to 30 percent from natural smallpox. Since the virus material used was not attenuated, it was possible for those receiving variolation to transmit ordinary smallpox to susceptible contacts. Because of its extreme virulence, variola virus must be handled in maximum containment facilities (BSL-4). These facilities consist of a separate building or clearly isolated section of a building with a sealed internal shell. Outer and inner change rooms separated by a shower are provided for personnel entering and exiting the facility. A double-doored autoclave, fumigation chamber, or ventilated airlock is provided for passage of materials not brought into the facility through the change room. Sewer and ventilation lines contain high-efficiency particulate air (HEPA) filters. Special individual supply and exhaust air ventilation is provided for laboratory workers, and pressure differentials are maintained to ensure the inward flow of air toward areas where the potential for hazard is highest . Although possession of the viral genome sequence does not yield total knowledge about the integrated biology, virulence, or transmissibility of a virus, much can be learned from a variety of studies based on these sequences. An important question is the variability of genetic information (DNA sequence) among different isolates of the virus obtained from patients in different geographic locations, although available collections are not well-ordered sets of variola virus strains. Multiple clones or PCR products should be sequenced to assess diversity. Significant differences are known to exist between the sequences of variola major and minor, but the extent of the variation and the importance of the identified differences for virulence in each of the two subspecies or even within individual isolates have not been determined . The extent and consistency of sequence variability might provide essential clues to the pathogenesis, virulence, and evolution of the virus and the nature of the infection. For example, a recent outbreak of monkeypox exhibited somewhat greater human-to-human transmission than had been the case in the past. However, preliminary results from sequencing of DNA fragments of monkeypox virus isolates obtained at various times since 1970 suggest that the virus has changed very little over this period. Thus at present, there is no clear evidence that the rate of human-to-human transmission of monkeypox is likely to increase . DNA sequence information from a characteristic set of variola virus isolates could enhance our capability to assess whether human monkeypox is evolving trans-mission characteristics similar to those of smallpox. Variola virus stocks need to be retained until a sufficient number have been cloned, or PCR amplifications have been obtained and analyzed. Although the sequences of the above strains are not entirely identical, they are nearly so. Direct sequence comparison of the Bangladesh-1975 and India-1967 strains shows that the viruses are 99.2 percent identical throughout the entire genome (see Figure 9-1) [6, 36, 38]. While in one sense this finding argues for relatively little variability, that conclusion should be tempered by the following considerations. Most of the differences are clustered in the terminal regions of the viral genome. Those regions contain genes that frequently are not essential for viral replication, yet typically are associated with pathogenesis, interact with the immune system, and affect virulence and host range. While only 18 of 200 proteins in the entire genome differ significantly between the Bangladesh and India strains, 7 of 30 open reading frames at the left terminus and 8 of 22 open reading frames near the right terminus show variation between the two viruses . It must be remembered that a very minor change -- a single base addition or deletion or a single amino acid coded by a genecan lead to profound effects in the corresponding proteins that determine variations in virulence. Moreover, available sequence data have been derived from plaque-purified isolates whose DNA was cloned into plasmids, and there are sparse or no data on heterogeneity within individual isolates, the effect of cloning in bacteria, or the heterogeneity in strains other than those discussed above. For full size figure 9-1 see original article, Chapter 9. As noted earlier, smallpox was eradicated prior to the modern age of cell and molecular biology, virology, and immunology. Therefore, the basics of viral replication, determinants of viral virulence, and pathogenesis of the disease are not as well understood as they are for other pathogens. Chapter 12 ... increased knowledge of variola infection has been limited largely to the cloning and complete sequencing of two strains of variola major from the Asian subcontinent, partial sequencing of one strain of variola major, and one strain of variola minor from Latin America. In addition, a few genes of other strains have been sequenced. In December 1801, the first vaccination against smallpox in Norway took place. Vaccine material came from Denmark, England, Ireland, and other countries; it was also obtained from a few local cowpox cases. What mattered was the effect, not the origin. Several reports indicate that variola virus itself, the cause of smallpox, was also used for human vaccination after passages through cows and horses. A vaccine institute for production of vaccine in calves was established in Kristiania in 1891. Cowpox was once a rare disease in cattle, but a total of 70,985 bovine cases were reported between 1889 and 1928. The source of infection was thought to be humans vaccinated against smallpox. Pox-like diseases were also registered in horses, pigs, sheep, goats and dogs at that time. Compulsory vaccination continued in Norway until 1976; smallpox is now eradicated. During the last decades, however, cowpox virus infections have re-emerged among zoo animals, domestic cats and humans in Western Europe, with small wild rodents and shrews as wildlife reservoirs. Vaccinia virus is also met with new interest as a vector in recombinant vaccines. Given the fact that the human population no longer has immunity against orthopoxviruses and the new possible exposure through pets and wildlife, it may be appropriate to reflect on poxvirus history in Norway in the light of the present situation. black and white graphic of Electron Micrographs of Variola Virus (Panel A, x200,000) and Varicella�Zoster Virus (Panel B, x200,000). current event with lethal end. Czerny CP, Eis-Hubinger AM, Mayr A, Schneweis KE, Pfeiff B. Institute of Medical Microbiology, Infectious- and Epidemic Diseases, Veterinary Faculty, Ludwig-Maximilians-University, Munich. We report about the infection of an 18-year-old man with an orthopox virus (OPV) which was transmitted by a cat. The infectious route from cat to man could be proved by epidemiological, virological and serological methods. The corresponding techniques are described. The patient had not been vaccinated against smallpox and was intensively immunosuppressed by medication on account of a severe endogeneous eczema combined with an allergic asthma bronchiale. A cyclic poxvirus disease developed with a generalised, partly confluent pox virus exanthema disseminated over the body. The clinical symptoms were similar to a "variola pustulosa haemorrhagica". The young man died of a lung embolism in the course of the intensive medical therapy. The haemorrhagic character of the pox virus pustules with central necrosis (pox navel) could be reproduced in the rabbit skin and on chorioallantois membranes. The pox virus isolated from the patient could be differentiated from variola, vaccinia and monkeypox virus. It is a member of the group of "cowpox-like viruses". The environmental importance of these OPVs is discussed. Cantagalo virus may derive from Brazilian smallpox vaccine. Damaso CR, Esposito JJ, Condit RC, Moussatche N.
Laboratorio de Biologia Molecular de Virus, Instituto de Biofisica Carlos Chagas Filho, CCS, Rio de Janeiro, RJ 21941-900, Brazil. The biological properties of poxvirus isolates from skin lesions on dairy cows and milkers during recent exanthem episodes in Cantagalo County, Rio de Janeiro State, Brazil, were more like vaccinia virus (VV) than cowpox virus. PCR amplification of the hemagglutinin (HA) gene substantiated the isolate classification as an Old World orthopoxvirus, and alignment of the HA sequences with those of other orthopoxviruses indicated that all the isolates represented a single strain of VV, which we have designated Cantagalo virus (CTGV). HA sequences of the Brazilian smallpox vaccine strain (VV-IOC), used over 20 years ago, and CTGV showed 98.2% identity; phylogeny inference of CTGV, VV-IOC, and 12 VV strains placed VV-IOC and CTGV together in a distinct clade. Viral DNA restriction patterns and protein profiles showed a few differences between VV-IOC and CTGV. Together, the data suggested that CTGV may have derived from VV-IOC by persisting in an indigenous animal(s), accumulating polymorphisms, and now emerging in cattle and milkers as CTGV. CTGV may represent the first case of long-term persistence of vaccinia in the New World. Copyright 2000 Academic Press. PCR strategy for identification and differentiation of small pox and other orthopoxviruses. Ropp SL, Jin Q, Knight JC, Massung RF, Esposito JJ. Division of Viral and Rickettsial Disease, Centers for Disease Control and Prevention, Atlanta, Georgia 30333, USA. Rapid identification and differentiation of orthopoxviruses by PCR were achieved with primers based on genome sequences encoding the hemagglutinin (HA) protein, an infected-cell membrane antigen that distinguishes orthopoxviruses from other poxvirus genera. The initial identification step used a primer pair of consensus sequences for amplifying an HA DNA fragment from the three known North American orthopoxviruses (raccoonpox, skunkpox, and volepox viruses), and a second pair for amplifying virtually the entire HA open reading frame of the Eurasian-African orthopoxviruses (variola, vaccinia, cowpox, monkeypox, camelpox, ectromelia, and gerbilpox viruses). RsaI digest electropherograms of the amplified DNAs of the former subgroup provided species differentiation, and TaqI digests differentiated the Eurasian-African orthopoxviruses, including vaccinia virus from the vaccinia virus subspecies buffalopox virus. Endonuclease HhaI digest patterns distinguished smallpox variola major viruses from alastrim variola minor viruses. For the Eurasian-African orthopoxviruses, a confirmatory step that used a set of higher-sequence-homology primers was developed to provide sensitivity to discern individual virus HA DNAs from cross-contaminated orthopoxvirus DNA samples; TaqI and HhaI digestions of the individual amplified HA DNAs confirmed virus identity. Finally, a set of primers and modified PCR conditions were developed on the basis of base sequence differences within the HA genes of the 10 species, which enabled production of a single DNA fragment of a particular size that indicated the specific species. What happens when vaccinia is released into the environment? Vaccinia has a broad host range, and unlike some other members of the orthopoxvirus family, is not indigenous to European wild life so far. Once released it might persist in the environment with unpredictable fate and effects. The wide dissemination of vaccinia-based vaccine resulting from extensive use increases the probability of vaccinia recombination with other orthopoxviruses present in target and nontarget animals. The vaccinia virus has been used most successfully for the vaccination against smallpox in humans, but has, in rare instances, caused serious adverse effects. Before launching any type of vaccination programme against sylvatic rabies, thorough studies on the chosen vaccine (recombinant or live attenuated virus) efficacy as well as on its cost/risk analysis are necessary. The cyclic nature of rabies epizootics makes comparisons of efficacy drawn from field studies a difficult task (Anderson, 1991; Brochier et al., 1990; Brochier et al., 1991). It is not within the scope of this report to evaluate efficacy and cost/risk factors. Criticism against the wildlife rabies vaccination programme exists (Mc Nally, 1994; Bruggemann, 1993), however, European and North American authorities and most virologists plead for this preventive measure. Finally, before releasing any genetically modified organism into the environment, economic, social and ethical concerns also should be carefully addressed. [Participation of vaccinia virus in the pathogenesis of different clinical forms of postvaccinal complications. Gurvich EB, Movsesiants AA, Stepanenkova LP. from 469 children vaccinated against smallpox revealed considerable differences in the frequency and the time of vaccinia virus detection in different clinical forms of postvaccinal pathology as compared with uncomplicated vaccinal process. During the postvaccinal period taking its normal course vaccinia virus was isolated from 7.3% of children only from the pharynx till day 8 following vaccination. in postvaccinal encephalitis from 57.1% of children, in vaccinal angina frove-mentioned complications vaccinia virus was detected in the samples obtained from the patients till days 24, 35, 15 and 24 respectively. The etiopathogenetic role of vaccinia virus in a number of postvaccinal complications is discussed. Recombination between two viruses (either by homologous recombination or by direct ligation of viral genomic DNA) can occur only if both viruses infect the same cell. Therefore the host ranges and the tissue tropisms of the viruses in question must overlap. Whereas poxviruses recombine easily with other members of the same genus, their recombination with viruses belonging to other families is not very likely. Because virus-specific promoter sequences are required for transcription, the effective transfer of genetic material from a poxvirus is expected to take place only if the recipient organism is another poxvirus, preferably of the same genus. Moreover, poxviruses, African swine fever virus, and to some extent iridoviruses are the only DNA viruses which replicate in the cytoplasm of the infected host cell (Fenner et al., 1989).